Indicators - Beacon Distributors Inc. The Model DM640 Cap series is a line of battery powered temperature indicators which accept a Thermocouple (DM640TC) or RTD (DM640P) input depending on the model. The face of the Cap houses a 4 digit LCD display. The back contains the screw terminal connections, battery, and three push buttons used to program and calibrate the unit. The unit is microprocessor based. The sensor type is selected from a simple to use menu system which is navigated by the use of the three push buttons located on the rear of the display. This feature enables the user to easily configure the device in the field without the use of any other equipment. In the DM640P you can choose between Pt100 or Ni120 RTD’s and in the DM640TC you can choose between K, J, T, R, S, E, L, N, and B thermocouples. The menu also allows the user to select units °F or °C, offset temperature, decimal point position, and password protection. The entire assembly is sealed into a Cap that fits directly into our SCH Series of NEMA 4X and Explosion Proof housings. Optional mounting kits are available for placement of the Cap into other style housings if needed. Intrinsically Safe ATEX approved version is available. The DM660P is a battery powered indicator that accepts a Pt100 sensor input and displays the sensor temperature on a 4 digit LCD display. The unit is microprocessor based and provides high accuracy performance over a wide ambient operating temperature range.Max/Min temperature buttons are provided on the front panel. Different sensor types are selected using a rotary switch on the rear of the unit. The DM700 I Cap is a two wire current loop indicator that is powered by the 4 to 20 mA DC process signal it is displaying. The face of the Cap houses a 4 digit red LED display. The back contains the screw terminal connections and three push buttons used to program and calibrate the unit by means of a simple menu. The menu allows the user to select units, input/output scaling, offset, decimal point position, and password protection. The DM700 I contains several linearizations which can be applied to display: square root, x 3/2, x 5/2 or a user defined 19 segment linearization curve. The entire DM700 I is sealed in a Cap that fits directly into the SCH Series of NEMA 4X and Explosion Proof housings. Housings have provisions for including temperature transmitters. 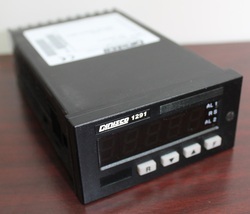 The DM720 is a compact panel mounted loop powered indicator that is designed to connect in series with a 4 to 20 mA current loop and display the value in engineering units. The DM720 is housed in a 48mm x 24mm DIN standard panel mount case and provides 10mm high LED digits. The engineering range is programmed by using easily accessible push buttons. The design of the product means no external power supply is needed and it requires less than 5VDC from the current loop. 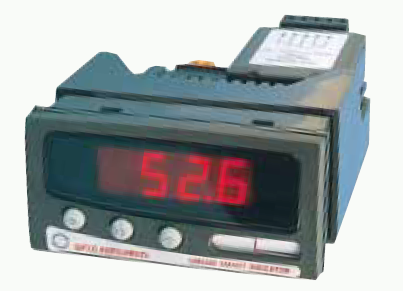 The DM3400 is a series of highly accurate and stable digital indicators. The DM3410 and DM3411 are for Temperature indication, and the DM3420 and DM3421 for Process. Designed without compromise, the DM3400 series uses leading edge technology to accept all commonly used temperature or process inputs. 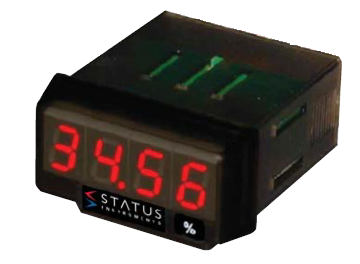 Engineering units are displayed on a high efficiency Red(Green option) LED display that provides daylight readability. The indicators can easily be used ‘stand alone’ or, using the Modbus serial communications option pod, as part of a larger system. The DM3430 is a true RMS current and voltage panel meter suitable for measuring AC or DC signals. 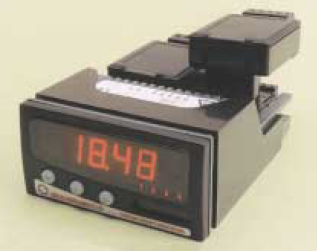 It has a four digit, high intensity LED display that can be set to show a fixed number of decimal places with “auto-rounding” to always show the maximum resolution. It is highly accurate and designed to measure AC or DC voltages up to 550 Volts or currents up to 6 amps. Readings can be displayed as current or voltage or, alternatively, the reading can be easily scaled from the front panel to take into account a multiplier from a transformed input or to display directly in engineering values. The 3.5KV isolation gives added protection when the instrument is used to measure high voltages. This is particularly important when measuring current, in that the instrument can be mounted anywhere in the measuring circuit and remains unaffected by any standing voltage. 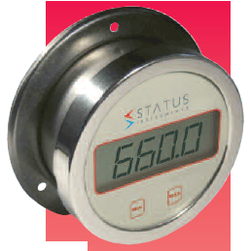 The DM3600 is an intelligent digital panel meter that can accept inputs from a wide variety of sensors. The DM3600 is available in two models. The DM3600U is a universal input panel indicator and the DM3600A, a universal panel indicator with totalizer functions. Alarm relays and 4-20 mA outputs can be added by means of plug in “Pods”. The use of TFML gives the user the ability to customize the DM3600 to his specific requirements. Many standard programs are available from our website. Custom programs can be written quickly and inexpensively. All functions are programmable from the front panel keys or via the optional RS485 serial port using our M-Config software. The program is easy to use and intuitive having pull-down menus and dialog boxes. The DM3600A totalizer function enables non-volatile storage of the integrated total to be maintained within the unit, even after loss of power. 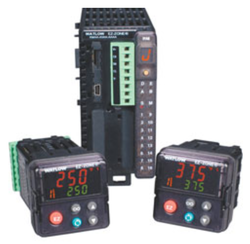 Output options (4-20 mA and alarm relays) can be selected to operate on either Process Variable (rate) or Total. solution for applications requiring process temperature viewing. The temperature meter can be ordered in 1/8 DIN-square panel mount or DIN-rail mount design configurations. 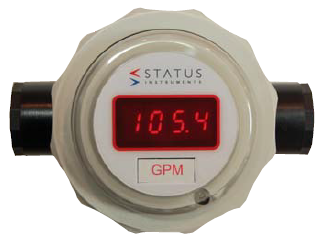 The TM temperature meter incorporates a microprocessor design platform. 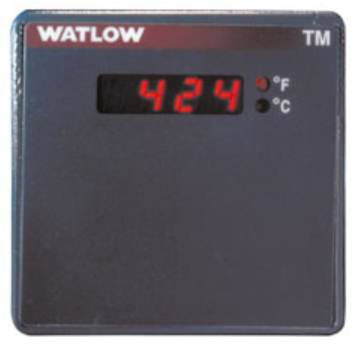 A red, four-character seven segment LED displays the temperature process value. 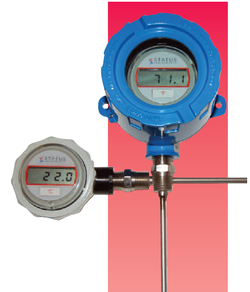 The TM temperature meters are UL® and C-UL® listed and carry CSA and CE approvals. 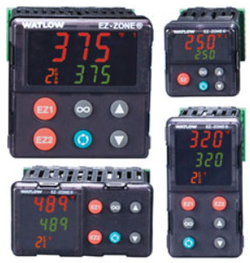 Watlow's temperature meters include industry leading service and support and are backed by a three-year warranty. Call 704-642-1880 for more details!